Are you looking for a comprehensive eLearning checklist for your next eLearning course design project? 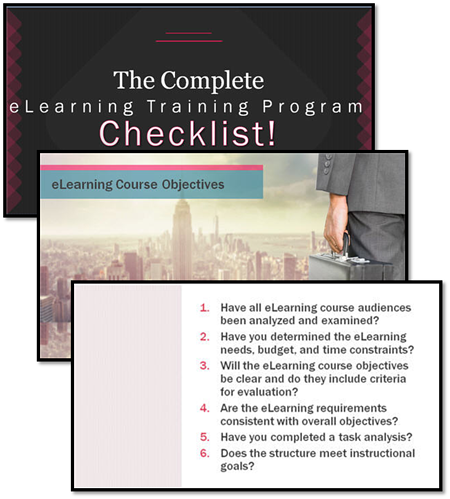 The Complete eLearning Training Program Checklist! Need help? As an award-winning training company, we understand that the key to successful eLearning development is tailoring solutions to the specific needs of learners. Contact us today to learn how our rapid eLearning development collaboration process ensures performance based eLearning solutions for your unique business challenges. Be ready! Download our eLearning checklist today. Ensure your organization is ready to launch your eLearning courses.